And this is only half the yard. If I had my wide angle lens, which is coming from Santa, the big guy on the far left in the photo, I could have gotten the whole scene in the picture. 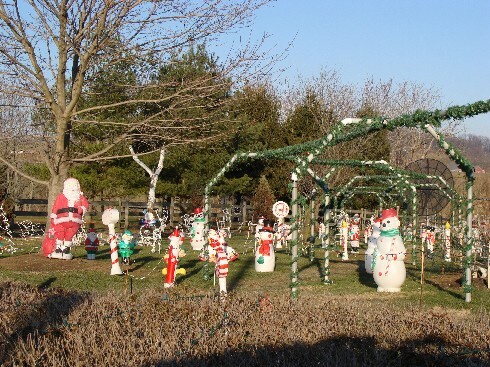 Aside from the giant satellite dish in the back, the entire yard is filled with Xmas decor. They even let you tour their yard between 5:30-8:30pm when all the lights on are. It is something to see! Trust me. 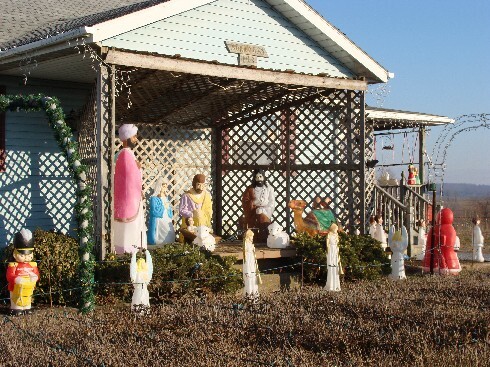 But in keeping with the spirit of Christmas they also have a nativity scene, which when added to all this other stuff makes the whole thing look like a giant keg party at a frat house. I am just saying! The neighbors down the road were not going to be outdone by this neighbor and they added their own version of the nativity scene. I don’t really get the poolside backdrop but at least they have some shelter from the wind! 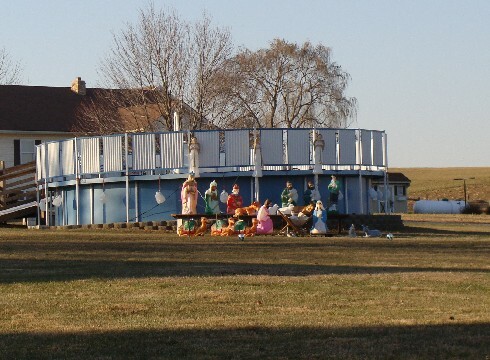 In the country landscape of Lancaster Country, known for it’s barns and turn out sheds, it never occurred to me that an above-ground pool would be used for sheltering the baby Jesus. I guess there was no room at the inn or the barn.